What is the National Road Safety Partnership Program? The program is not a prescriptive approach but aims to complement existing safety legislation by providing access to a ‘knowledge bank’ from a diverse network of organisations to given them the resources to implement their own initiatives. The tools will help make the business case for organisations shifting their safety focus from ‘having’ to safety to secure a contract to ‘wanting’ to because it is simply good business. Find out more about current activities. 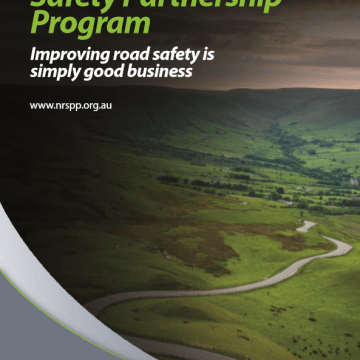 The NRSPP aims to help Australian organisations develop a positive road safety culture and, in turn, become an example for others to enhance road safety nationally. This is achieved by building and sharing knowledge of effective strategies to reduce road-related trauma, and to foster national networks and collaboration for the benefit of improving road safety. A number of organisations within Australia and internationally have introduced road safety initiatives which result in a safer workforce, and in turn, a safer community. The returns are often also realised in other ways such as customer loyalty, decreased operating costs, a more skilled workforce, overall reduction in corporate risk, and enhanced brand recognition. In 2011, the National Transport Commission (NTC) began to engage with the Australian business sector about developing a collaborative program which would encourage more businesses to introduce these types of initiatives. The aim was to highlight the role that business sector – not only the general community and governments – can play in contributing to the National Road Safety Strategy 2011-2020 objective to reduce Australian road deaths and injuries by 30 per cent by 2020. This consultation process revealed a desire from Australian businesses for a national collaborative program on road safety that draws on the strengths of existing programs and initiatives, whilst encouraging better practice, innovation and shared learning. A Steering Committee to guide the development of the program was established in June 2012, involving some of Australia’s leading businesses. The Steering Committee was heavily involved in the development of a strategy document to underpin the program which was released by the NTC in June 2013. The NRSPP was launched 5 May as part of the Decade of Action for Road Safety Policy and Donor Forum 2014 by Prince Michael of Kent, Patron for The Commission for Global Road Safety. The forum was a high profile forum which brought together international and domestic speakers to discuss the policy debate surrounding road safety in the Asia Pacific region, outline the issues and suggest possible solutions. Attention was focussed on the road safety problems in low and middle income countries where road trauma is increasing dramatically as these countries experience rapid motorisation. The program is being managed by ARRB and is funded over the next three years by ARRB, NSW Centre for Road Safety, NSW Motor Accident Authority, the NTC, the South Australian Motor Accident Commission, VicRoads and the Transport Accident Commission.